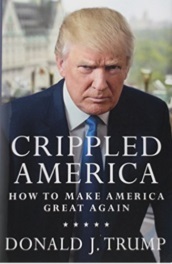 Click here for 28 full quotes from Donald Trump in the book Crippled America, by Donald J. Trump. Donald Trump's critics say he has no foreign policy experience, no domestic policy experience, and no serious policy stances at all. Trump's campaign theme--"I'll make America great"--implies that voters should simply trust that Trump can get it done, without Trump having to get his hands dirty with specifics. What Trump's critics mean when they shout "he has no serious policy stances" is that "I disagree with his policy stances." Or perhaps "I disagree that someone like Trump should run for president." Or perhaps "Trump hasn't paid his dues in the Republican Party." Trump's critics should say what they mean--Trump certainly does--which is why Trump is more popular than his critics! Unbiased observers might know that Trump has two previous policy books as well: The America We Deserve, written for the 2000 presidential race and Time to Get Tough, written for the 2012 presidential race. Biased observers ignored those book in 2000 and 2012, pretending that they didn't exist when Trump considered running for president in those races. And those same biased observers will ignore his new book in 2016. Say what you want about disagreeing with Trump's policies, but he DOES have policies! Promoted gender equality in a male-dominated industry. Any business of any size will pay no more than 15% tax. Dept. of Education runs top-down one-size-fits-all system. Let schools compete: charters, vouchers, and magnets. No federal government profit from student loans. We have 2 trillion barrels of oil; enough for 283 years. Green energy is just an expensive feel-good for tree-huggers. Happiest people have great families & God in their lives. Opening gates to Syrian refugees invites in ISIS. Ignore career diplomats who insist on nuance. Chinese are savvy businesspeople: our enemy who need us. Mutually profitable 2-way relationship with the media. Make concealed-carry permits valid across all states. Insurance companies love a lack of competition. Building up military is cheap when you consider alternative. VA is one of the most incompetently-run agencies. 351,000 criminal illegal aliens in our prisons. Building 1,000-mile wall is possible, if we make commitment. Cut off federal funds to sanctuary cities. Teachers unions are obstacles to improving schools. Rebuilding America will create 13 million jobs. I give people what they need and don't get: The Truth. Our flag represents equality, hope, fairness, & courage. I love God, and I love having a relationship with Him. Crumbling infrastructure costs $200B in reduced productivity. We should have demanded a deal with Kuwait to liberate them. Blunder to announce withdrawal timetable from Afghanistan.